Do you love Chevy Chase? 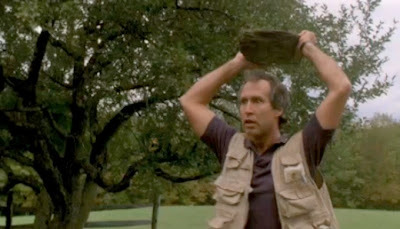 I love Chevy Chase. Funny Farm ranks in the Top 10 Films I've Seen 25+ Times. It's just one of those movies that will randomly air on a Sunday afternoon while I'm folding/cursing laundry. And I'll keep it on. Every time. While they're no Clark and Ellen, Andy and Elizabeth Farmer are humorous to watch as they unsuccessfully attempt to live a life in the country. Since I've been neglecting the "three sheets" side of the blog as of late (plus, my mixer would appreciate the day off), today's post is dedicated to a fine, well-crafted beer. Jolly Pumpkin Bam Biere, a farmhouse ale. Jolly Pumpkin Artisan Ales brews out of Dexter, Michigan. I bought this bottle when I was in San Diego last September for Mike's birthday brewstravaganza. Unfortunately, they don't distribute Jolly Pumpkin in the DC area so I had a few mementos shipped with us on the flight home. What's a farmhouse ale, you ask? Also commonly known as a "saison" (for those of you who opted for Spanish in high school, that's French for "season"), farmhouse ales originated in the French-speaking Wallonia region of Belgium. They were brewed in the winter so that when the warmer months rolled around, farmers could refresh themselves after a hard day's work. Farmhouse ales are typically pale in color, rich in spices, moderately tart and have a yeasty, almost earthy quality to them. Complex. Like a ball of Christmas lights. A little story behind the cute pup on the label. Alright, let's open this sucker. 1. No shoes in the dojo. 2. If you open a beer, you have to sink the cap. Pour until you get two-fingers worth of frothy, creamy head. Hazy with bits of yeast sediment. Notes of lemon and apple, crisp, mild tartness with no lingering sourness on the tongue. Clean, dry finish. Perfect for a Summer day. Apparently, reviewing beer makes me lose the ability to form complete sentences. If you're interested in trying out the style, I recommend Ommegang Hennepin, The Bruery Saison Rue and (perhaps the most well-known) Saison Dupont. Pick one out, bring it home and enjoy it on your patio. There is so much good beer out there...seek it out. And don't forget your fresh 'maters. Man I haven't seen Funny Farm in FOREVER. Do you guys ever watch Community? It's really pretty awesome. Best new comedy show I've seen in ages. You should check it out. Chevy Chase has got some kick left in him after all (I wasn't so sure after his talk show escapade). Your explanation about farmhouse ales reminded me of something I recently learned - what 'farmstead' dairy means. Farmstead cheese or milk means 100% of the product came from the same herd of animals, as opposed to a huge amalgamation of many different herds over many different farms and regions. The more you know, huh? I've heard good things about Community - I didn't realize Sparky was on it! I'll have to check it out. I trust your comedic judgement. Interesting...this is the first time I'm hearing the term "farmstead" in reference to a food's source. I think I'll opt for farmstead going forward. I want a moonogamous relationship with my dairy products. Can't even begin to describe how perfect an ice cold Saison / Farmhouse Ale is for a hot day. Well I could but then you'd be stuck reading a bunch of similes describing how perfect it is. Nice pour pics and use of our farm props. Do horses eat tomatoes? Not sure if the scene I set up is realistic. Community is the best and I'm so happy Parks & Recreation picked up. Chevy is amazing on it. Funny Farm is one of my favorites. "Please deposit 10 cents please." Red dog, that mail guy, the whole town, such awesomeness! You gotta get up earlier in the morning than that, Farmer. I know the sound of two pennies being dropped into a jelly jar. Hi Margie. You should delurk more often. You got it. :) Those 2 old ladies always crack me up. "Foul language is an automatic disconnect." I need to try this Al - cleaning the patio now. Two things: One day, I will sink the cap darn it. And two, love the props. Is that part of the John Deere farm set?? I love the little tomato statues. They are adorable. Did you pour yourself a glass of wine or beer?